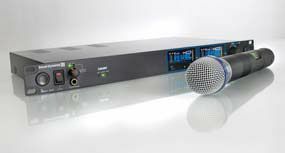 GERMANY—Microphone and conference systems manufacturer beyerdynamic is claiming a world first for the NE 900 D Cobra 2-channel receiver for the Opus 900 wireless mic system, which provides an integrated CobraNet inteface to connect to any CobraNet-capable device. The beyerdynamic Opus 900 system. Transmission is via Cat-5 cables using standard Ethernet and is compatible with products from over 40 manufacturers. The company says its CobraNet capability offers a number of significant advantages, particularly for large-capacity systems or complex facilities with multiple rooms. Cabling is considerably reduced, since CobraNet allows up to 32 channels to be transmitted in each direction with a single 100-Mbit network cable. Using the CobraNet protocol, signals can be sent to and from any node on the network and settings can altered in software without any physical changes in cabling. The receiver can be placed anywhere in the room, saving on analog inputs, and since digital transmission via CobraNet is less prone to interference, than analog transmission, a high sound quality is assured, even over long distances.